Mankind has received a transmission from space. An alien ship is coming. A hardened officer has been choosen to assess the danger. Dive into the heart of Captain Lycop: Invasion of the Heters, a space shooter mixing adventure, action and management. Face off against pen-pushing insects, merciless enemies and epic bosses. Your only hope is to banish all cowardice and follow a virtuous path. 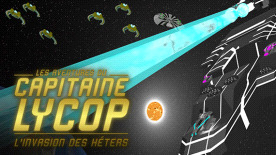 Captain Lycop: Invasion of the Heters gives players a space shooter with complete freedom of movement. Shoot your way through several zones and a complex story. Scavenge ennemy ships to equip modules on your own. Your ship holds up to seven modules pointed in any direction, allowing you to choose your play style. With a wide tech tree, replay the adventure with varying strategies choosing among 31 different technologies. Discover an alien universe with its own rules, mixing friendly yet annoying pacifists, administrators with little regard for your future and conquerors with no morals. The outcome of the adventure will depend on your choices. But most of all you must overcome! Overcome hoards of enemies, led by bosses as feared as they are fearless! Overcome with no fear! Because Captain Lycop is no coward.